The three greatest qualities of a Christian are faith, hope and love and they are also the three greatest needs in the world today. Love, unconditional self-giving, is the opposite of the self-serving greed that dominates most of modern society. Faith, complete trust and confidence in God, has been replaced by qualified faith in science, wealth and power structures. Hope, the expectation of future good, has in the main become a whimsical wish for some light in a dark future. I am writing this article early in 2012 and I want to focus on the light of hope that we as Christians are called upon to shine into the gloom of our current national and global circumstances. 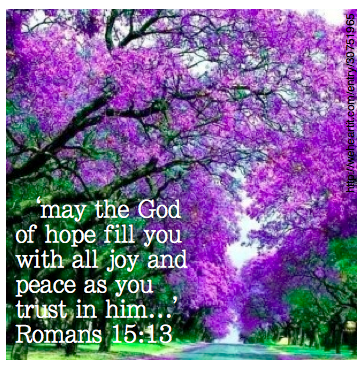 Paul’s benediction to the church in Rome is, ‘may the God of hope fill you with all joy and peace as you trust in him, so that you may overflow with hope by the power of the Holy Spirit’ (Romans 15:13). Our God is the God of hope, the source of real hope, and the basis for that hope. But what is the nature of our hope in God? Firstly, it is the hope of eternal life. In Titus 3:4-8 Paul writes; ‘When the kindness and love of God our Saviour appeared, he saved us, not because of righteous things we had done, but because of his mercy. He saved us through the washing of rebirth and renewal by the Holy Spirit, whom he poured out on us generously through Jesus Christ our Saviour, so that, having been justified by his grace, we might become heirs having the hope of eternal life.’ Our hope of eternity with God is not based on anything we have done or could do, but upon His mercy and grace. It is therefore a real and unconditional hope. Secondly, our hope is focused on the here and now (1 Timothy 6:17-18) and this present hope also has its source and substance in God. Jesus’ promise to his disciples, and therefore to us, is that He will never leave us but will be with us until the very end (Matthew 28:20). Because of His constant presence with all who are born of the Spirit we can be assured that in all things He will work for our good (Romans 8:28-29). This is the basis for our hope for tomorrow – Jesus is with us and He seeks to work through all the circumstances of our lives towards our highest good. Because of this hope we can have the joy and peace of which Paul writes, both now and eternally. The 23rd December, 2011 edition of one of the local community newspapers carried an article titled ‘Psychic makes 2012 prediction’. These prognostications included cripplingly high fuel costs; dire shortages of electricity, food, and water; disruptions to all forms of transport; the breakdown of communication systems, computers and cell-phones; and the collapse of economic structures leading to bartering systems! But, hey, the good news is that the manual typewriter will come back into fashion and we will have some really cool family times because of the lack of television, computers and cell-phones. Now I put no store at all in psychic predictions but they do say something about how people are thinking about the future – dark and without hope. Our societies need our light. Jesus said that we are the light of the world (Matthew 5:14). Why is this? We are the light of hope because we are the ones who know the source of light and hope, Jesus Christ, and our mandate is to overflow with hope by the power of the Holy Spirit. The substance of the hope which we offer is that through Jesus all who believe can be born again by the power of the Holy Spirit into a living relationship with Almighty God. Because of this, all who are saved by His grace can enjoy His constant presence in their lives and know with certainty that He works in all circumstances towards their highest good. Finally, when their journey together with Him on this planet comes to an end they have the sure hope that their lives will continue with Him into eternity.